Saucony’s marketing pitch: Lightweight, fluid, and flexible. Upper: Engineered mesh, inner sleeve, ISOFIT strap based lacing. 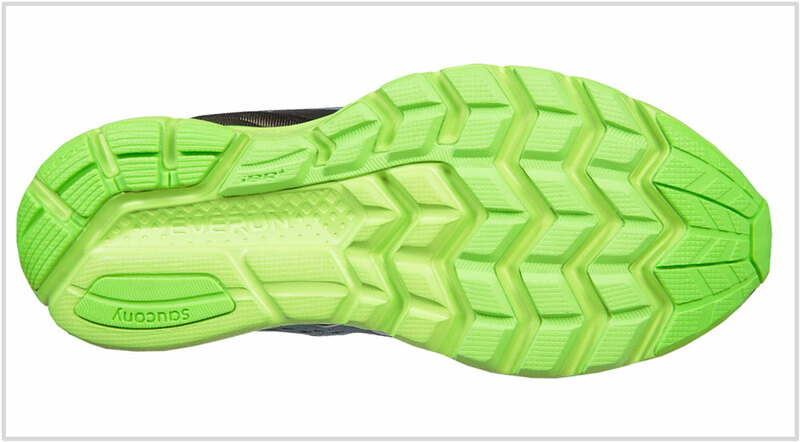 Midsole: Everun topsole over a single-density EVA foam midsole. 4 mm heel drop. Think of the Zealot ISO as a plusher Kinvara with more upper room. Features the same 4 mm heel-to-toe drop, but with increased cushioning over the Kinvara. Saucony, like Brooks, is a running focused brand. This means that you have access to plenty of shoe models which aren’t found in a typical adidas or Nike assortment. Do you need a track or a XC spike? No problem, Saucony has you covered. Want to go running in the snow? The Saucony Razor Ice is the shoe to get the job done. For those new to the brand, the sheer breadth of Saucony’s assortment can get overwhelming. But once you get used to it, you can quickly see the difference between a Triumph, the Ride, or the Freedom. 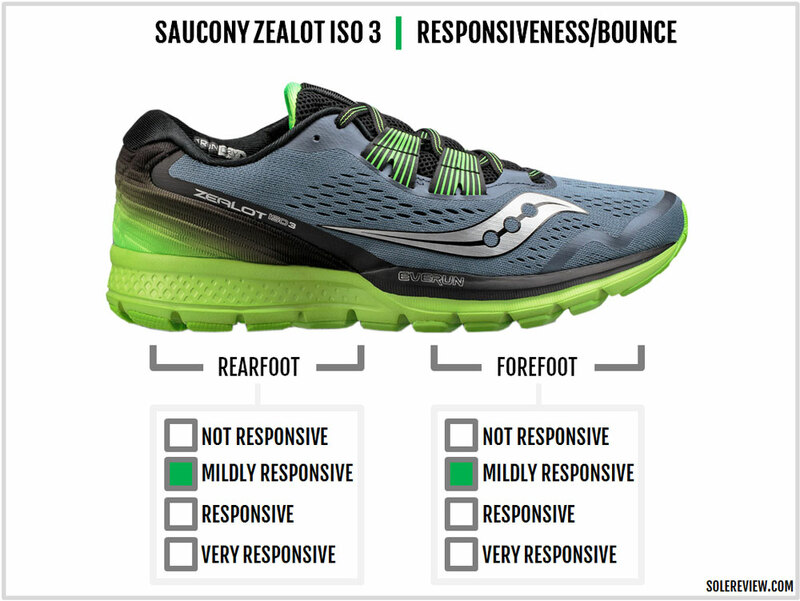 Or for that matter, the functional tiering between a Kinvara 8 and a Zealot ISO 3. And who is the Zealot ISO targeted at, exactly? 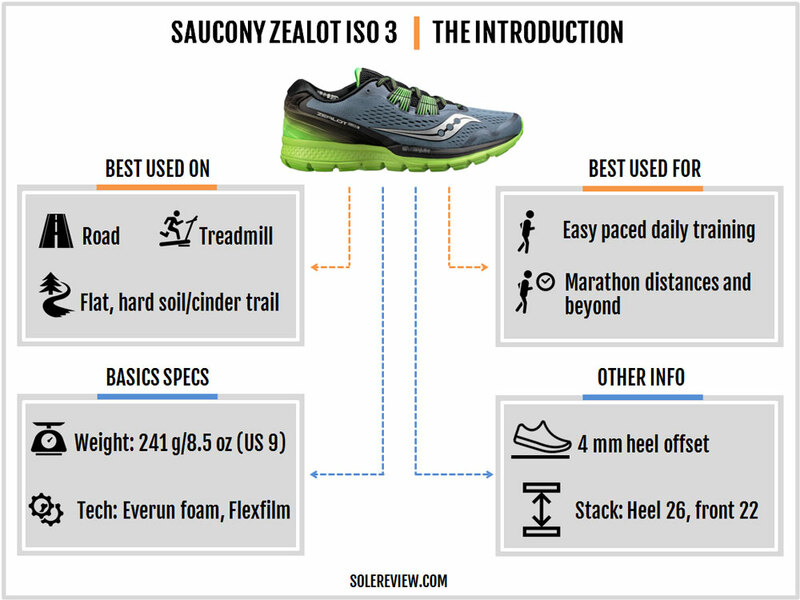 If you’ve run in the Kinvara, describing the Zealot is easy. 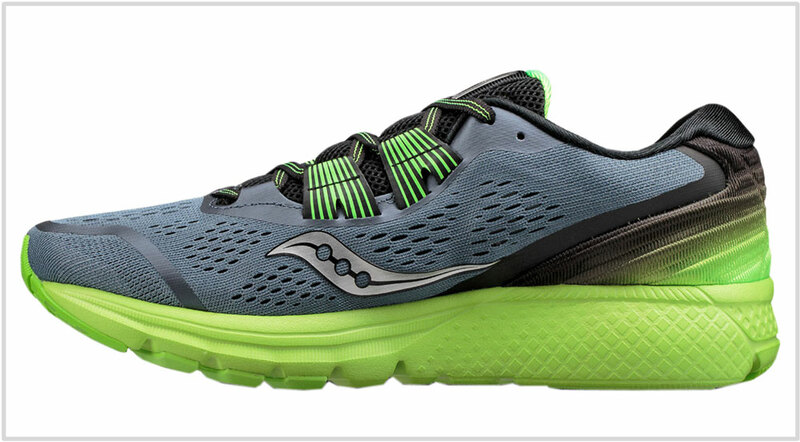 The Zealot ISO 3 is a Kinvara with more cushioning and increased interior space. Sure, all this comes at an upcharge of $20. But if you found the Kinvara wanting in cushioning and upper room, then the price of admission is well worth it. That said – the Zealot isn’t a substitute for the Kinvara, but rather a supplement. 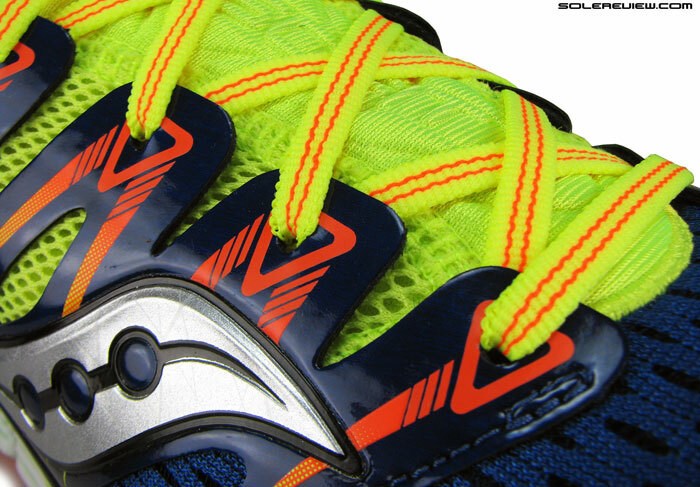 The Zealot has a thicker midsole, so it does not feel as fast or effortless to run in. For best results, you should get the Zealot to rotate alongside the faster Kinvara. 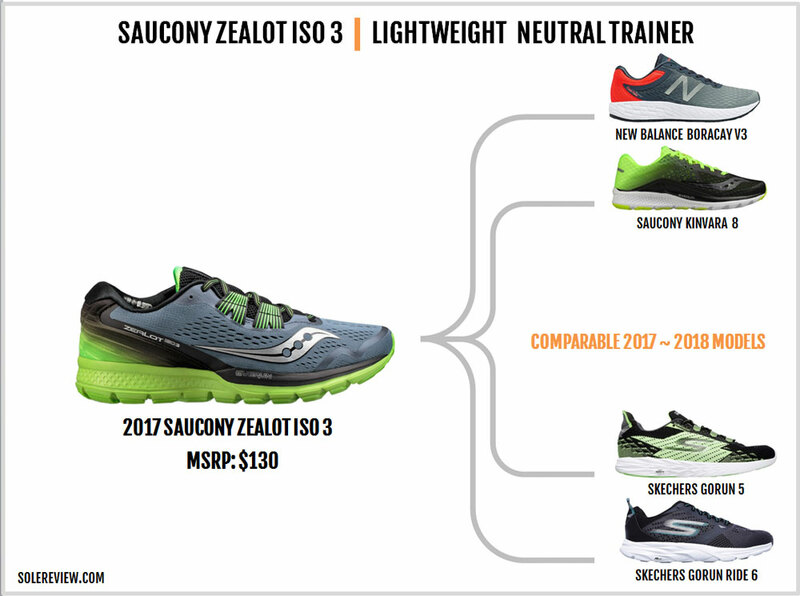 We must say, though, that the 2017 Zealot ISO 3 is closer to the Kinvara than the ISO 2 was. The brand new midsole trades the firm SRC foam crashpad for single-density EVA foam – similar to the Kinvara’s construction. Now let’s take a closer look at the upper and midsole changes on the 2017 model. The Zealot 3 gets a design refresh from the ground up. The midsole and outsole design have been updated, and these changes aren’t merely superficial. The upper fit quality changes, and so does the ISO 3’s ride character. The last year’s Zealot 2 was a busy looking shoe. The forefoot and midfoot was layered with fused Flexfilm, and the glossy heel had a lot of molding details. The midfoot used a 2nd generation ISOFIT system (the 2014 Triumph ISO had 1st generation ISOFIT) which had multiple lacing straps. This year’s Zealot ISO replaces the floating ISOFIT with two independent straps. These straps are similar to what Kinvara calls ‘Prolock,’ except that there are two of them here. The straps form extremely wide lacing loops over the midfoot, and they splay wide below. The straps float over the inner sleeve and the outer mesh covering. With the introduction of wider loops, the number of lacing rows on the Zealot 3 drops to five – versus six on the V2. The laces used are standard Saucony – flat and semi-elastic. The outer upper is mostly engineered mesh and is free of all the layering which cluttered the Zealot 2. Except for the narrow band over the toe-box, the fused Saucony logo, and the lacing area reinforcement, there’s no Flexfilm over the rest of the upper. This makes the V3 much sleeker looking than the previous model, and that’s not just due to the forefoot and midfoot. Even the rearfoot gets the clean-up treatment. Molded mesh is used instead of synthetic to make the Zealot’s upper design cohesive, though the hard internal counter stays. The collar heel is made of soft-touch ‘Rundry’ lining with increased foam padding over the V2. The tongue has a simple design. Most of it is spongy spacer mesh on top with a softer lining below it. Some foam padding is quilted between the two layers, and there’s a reflective trim over the flap. The tongue is part of a full inner sleeve, so there is absolutely no slide. Saucony has made an important midsole design change ever since their shoes started featuring Everun. 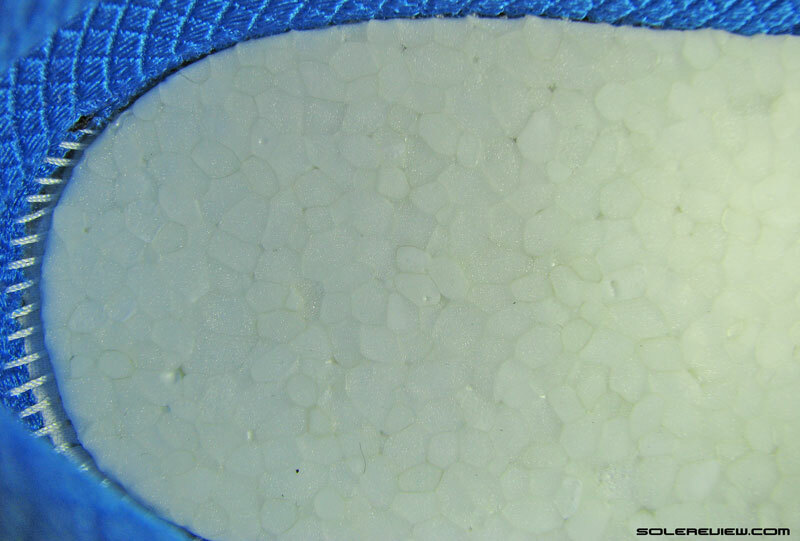 You see, many earlier Saucony midsole used a combination of Powergrid foam and a SRC foam crash pad. The Powergrid foam used to be an upper midsole layer placed just below the insole for added cushioning. 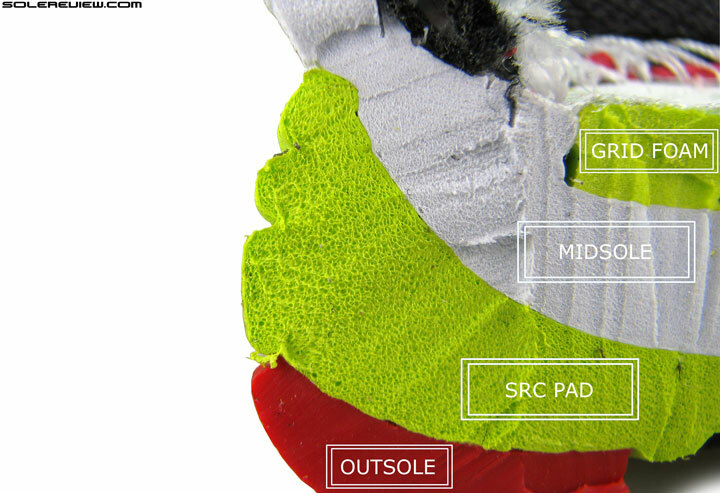 The SRC crash pad was a firmer and resilient foam block located under the heel and midfoot. This was meant to smooth rear strikes and forward transitions. With the introduction of Everun – Saucony’s new expanded Polyurethane foam cushioning – Powergrid and SRC are becoming rarer by the day. Based on what’s available currently, Everun is used in three forms. Models like the Freedom ISO have a full-length version, whereas the Hurricane and the Triumph have larger midsole inserts. The third kind of Everun is the ‘topsole.’ This is just a thin layer of foam which works in tandem with the insole above it. The Zealot ISO comes with an Everun topsole underneath its removable insole. The Zealot ISO 3’s midsole drops the SRC crash pad used on the V2. 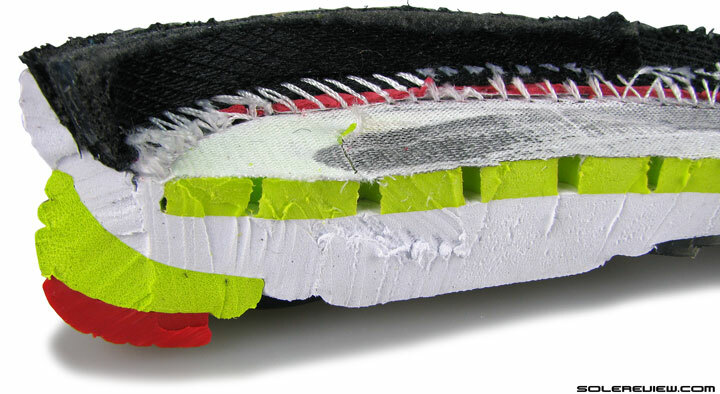 The midsole is now made of a single-density injection molded foam, which is similar to how the Kinvara is constructed. 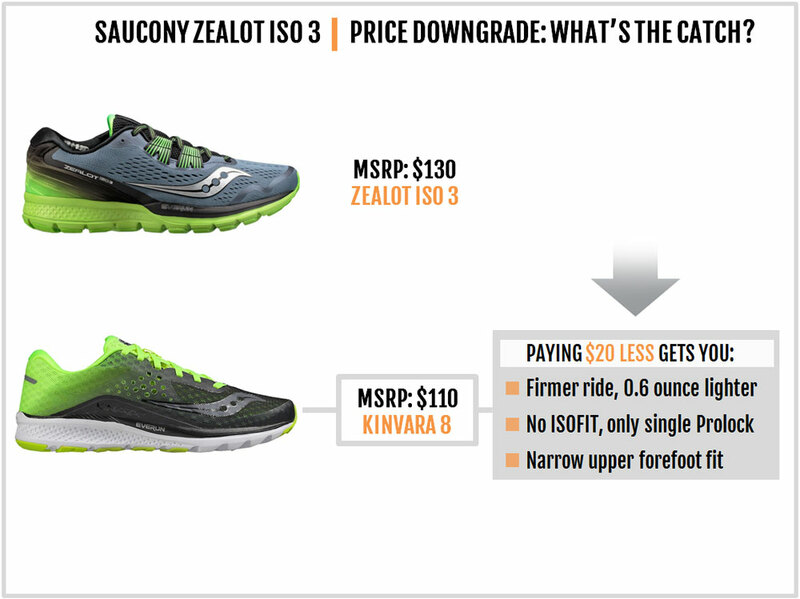 This change makes the Zealot ISO 3 much lighter than its predecessor. The Zealot ISO 3 is now 8.5-ounces – a full ounce lighter than the ISO 2. Not all of the weight saving happens due to the midsole. 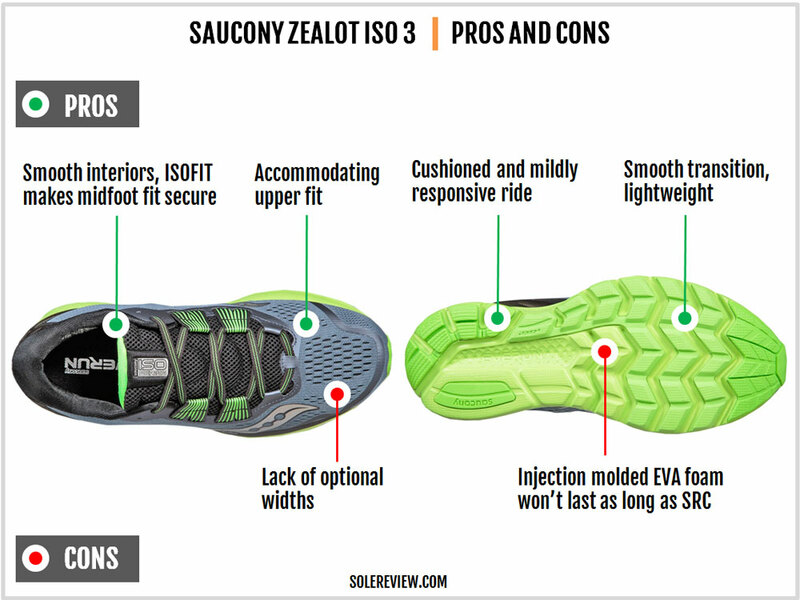 Compared to the Zealot ISO 2, the outsole loses some rubber coverage under the inner heel. The area has a smaller rubber piece, so most of the inner rearfoot is exposed foam. The outsole layout follows the current Saucony format. The forefoot is made of soft blown rubber molded in Chevron-shaped strips. This design is similar to the Ride and Triumph. 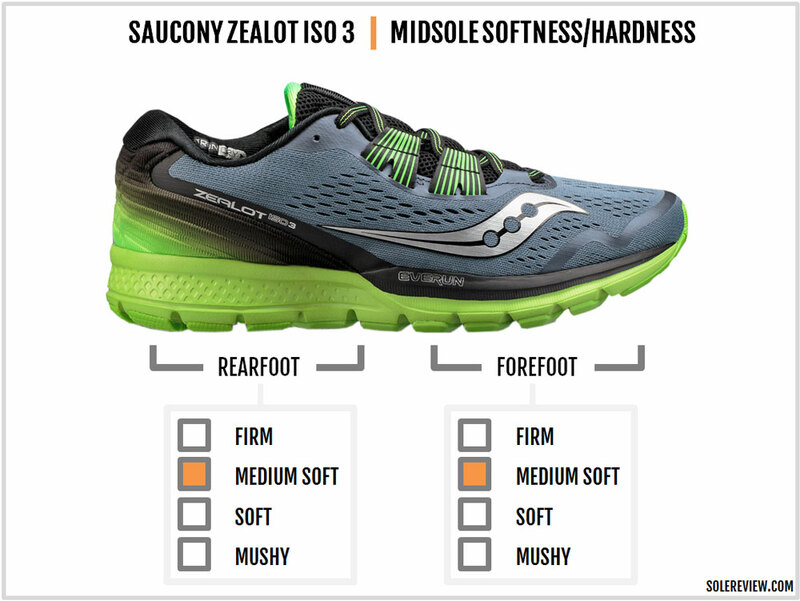 The Zealot outperforms the lighter Kinvara on outsole durability, placing it at par with models like the Ride and Triumph. There’s more rubber under the forefoot, and the heel rubber is placed over high-wear areas. 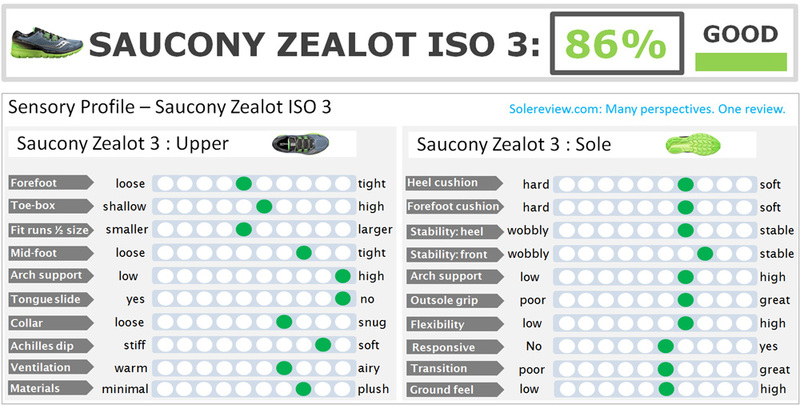 However, note the Zealot ISO 3 lacks the firmer SRC crash pad. This means that the injection-molded midsole will lose its cushioning properties a bit faster. Regardless, the Zealot should go up to 300 miles easy. Nothing on the upper suggests a durability concern. The 2017 Zealot’s upper fit is an improvement over the Zealot ISO 2’s narrow and shallow fit. The change in upper fit happens because of two things. The first reason is easy to see; reducing the amount of Flexfilm makes the interior fit more accommodating. Ventilation also benefits from a cleaner upper design. The second factor happens to be the redesigned lacing row over the forefoot. The loop for the first row of lacing is much wider (and placed higher) than the small loops used on ISO 2. This helps ease the fit pressure too. 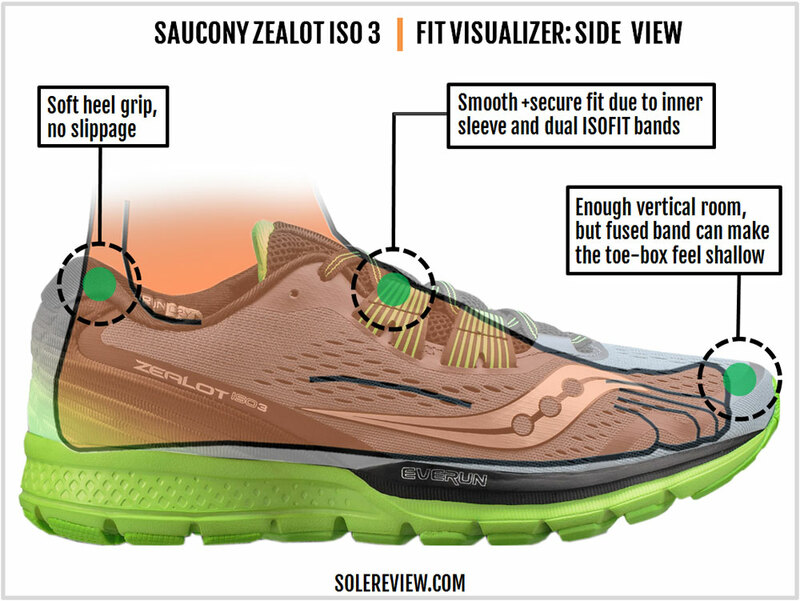 Though the Zealot is only available in a single width, the forefoot will fit a variety of foot shapes. The toe-box shallowness (from the ISO 2) isn’t completely eliminated. The fused band running over the upper causes a slight shallowness in the front. This does not cause any discomfort, but the toe-box isn’t as high as one would like it to be. 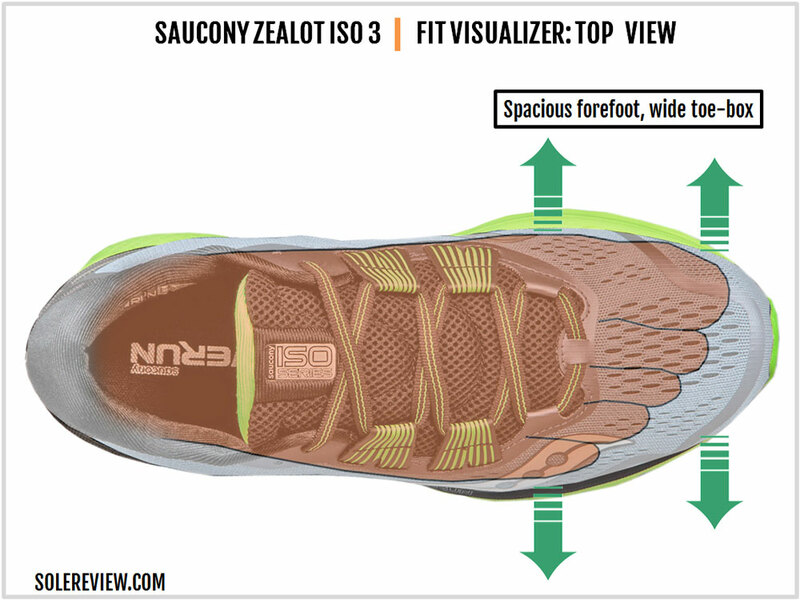 The Zealot ISO 3’s midfoot fit is a noticeable improvement over the previous year, and this has to do with the new ISOFIT system. Using two separate bands instead of a large panel helps lock down the midfoot better. As always, the tongue is a part of a full sleeve, so the insides feel smooth and seamless. The updated ISOFIT also removes the side pressure otherwise exerted by the full-size ISOFIT panel. This makes the new Zealot more comfortable than the Zealot V2. Is there such a thing as too much heel padding? 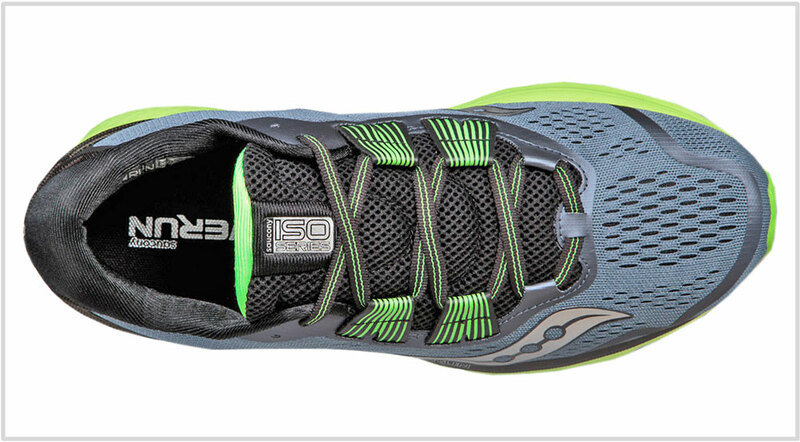 The new collar design adds more foam behind the soft ‘Rundry’ fabric, making the heel much softer than the ISO 2. But it doesn’t grip as good – at best, you’ll see no improvement over the Zealot ISO 2’s heel fit. First of all, let’s get the Everun business out of the way. It exists on the Zealot in the form of a ‘Topsole,’ a foam sheet which is a few millimeters thick. Along with the insole, it merely provides superficial responsiveness. In the bigger scheme of things, the Topsole is a small part of the Zealot’s ride character. The Zealot is mildly responsive, but that’s also due to the exposed heel cavity (on the outsole) splaying. However, the new lightweight midsole feels slightly less responsive than before. The V2 had a firmer SRC crash pad under the heel and midfoot which gave the rearfoot a snappy ride. What you get in exchange for trading the SRC pad is a softer ride. The Zealot has increased softness over last year, just not very resilient. The heel outsole is softer, and the reduced amount of outsole rubber also make the landings softer. There’s a good reason why the Zealot is described as a plusher Kinvara. It has the consistent cushioning of the latter but far more forgiving over longer runs like a marathon. The Zealot is also lighter than it looks – it’s only 8.5 ounces/241 grams for a half pair. Though the Zealot shares quite a few traits with the Kinvara, it isn’t a fast shoe. It performs exceedingly well as a cushioned trainer for easy-paced runs, but falls short when running fast. The injection-molded midsole lacks the pop of the SRC pad, so you’ll miss that edge from the Zealot 2. Also, the forefoot is quite flexible so you won’t get the quick touch and go during the transition cycle. The 4mm offset midsole runs thick throughout, making the Zealot cushioned regardless of how you land. The front has a softer blown rubber outsole, and this makes the forefoot landings padded and muffled. The blown rubber compound delivers great grip too. The Zealot is pretty stable with a minimal heel bias. The forefoot has the typical ‘Saucony flare’ – the base is noticeably wider than the top. This helps maintain forefoot stability, and the rearfoot isn’t bad either. 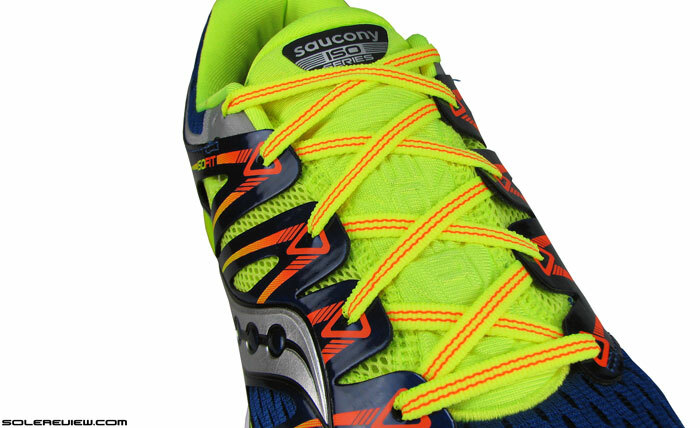 The upper also keeps the foot locked down, helped by the improved ISOFIT midfoot straps. It’s easy to list the Zealot’s positives. It’s got a comfortable upper fit which includes a spacious forefoot and a secure midfoot. Also, the seamless construction produces a smooth interior environment. The lightweight midsole has plenty of cushioning for the long haul, and the transitions feel consistent. The Zealot is also priced right, offering a lot of value for its $130 MSRP. There aren’t many negatives worth mentioning. 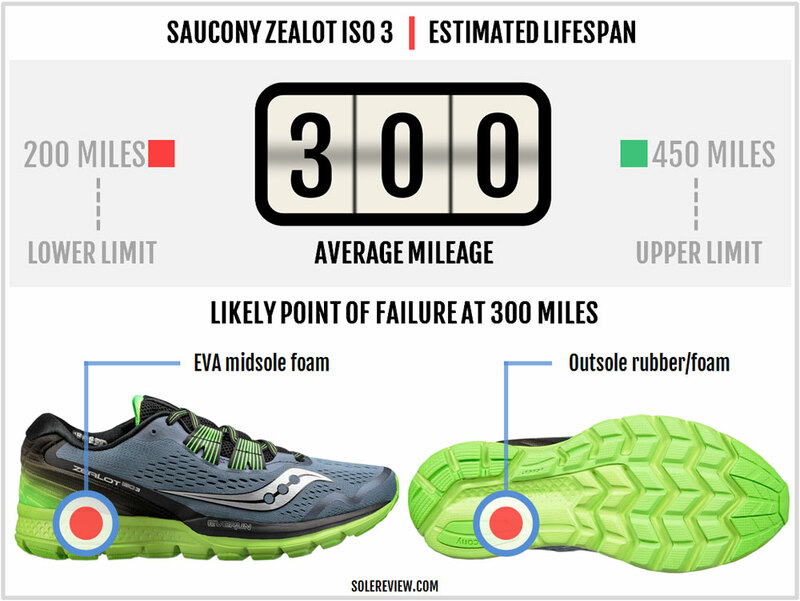 But the lack of additional widths is a minus, and so is the marginally lower sole durability when compared to the Zealot ISO 2. This year’s Zealot is a major upgrade over the V2. The upper loses most of the outer covering, thus freeing up (forefoot) interior room in the process. The midfoot provides better lockdown as the ISOFIT panel evolves into a twin-strap configuration. By most benchmarks, the Zealot ISO 3 is a design improvement over the ISO 2. The ride is slightly softer due to the switch to the single density, 100% injection-molded midsole. But removing the firmer SRC crash leads to the loss of the slight responsiveness which the Zealot 2 had. So who should get this shoe? The Zealot ISO 3 is a daily cushioned trainer, but with a 4mm offset. Another way to view the Zealot 2 is to do so as a plusher Kinvara. Which means that you’ll have a lot of cushioning to do long and easy miles, but without the relatively fast feel of the Kinvara. This puts Zealot in a select group of models – see the ‘similar shoes’ section below for more. If you think the Triumph ISO 3 to be an upgrade from the Zealot, you’d be only half right. The Triumph has a higher heel-to-toe drop of 8 mm with an Everun midsole insert. This puts it in a slightly different neutral cushioning class than the Zealot. 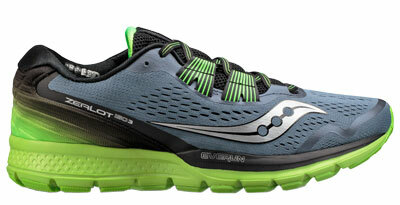 On the other hand, the Kinvara 8 is a slimmer version of the Zealot. With a 4 mm drop and a single-density midsole, there’s a certain level of ride resemblance. Except that the lighter Kinvara feels faster to run in and fits narrower than the Zealot. The Kinvara is a faster shoe than the Zealot, but the Saucony Type A8 will work better for shorter road races of 5 and 10K. While you don’t need a third shoe, the Ride 10 can fill in as a daily trainer with a slightly faster ride than the Zealot. The Pegasus 34 is in the same class as the Ride 10, so that’s a daily trainer to have if you go the Nike way. Just that you know, these models have a 8 mm and 10 mm drop respectively. The New Balance 1400V5 is similar to the Saucony Type A8, except that the 1400 has a 8 mm heel-to-toe drop. A 4mm heel drop in a cushioned trainer package? They’re not many of them around, but we’ll do our best to round some of them up. The New Balance Boracay V3 is the successor to the V2 – which happened to the successor to the Fresh Foam 980. 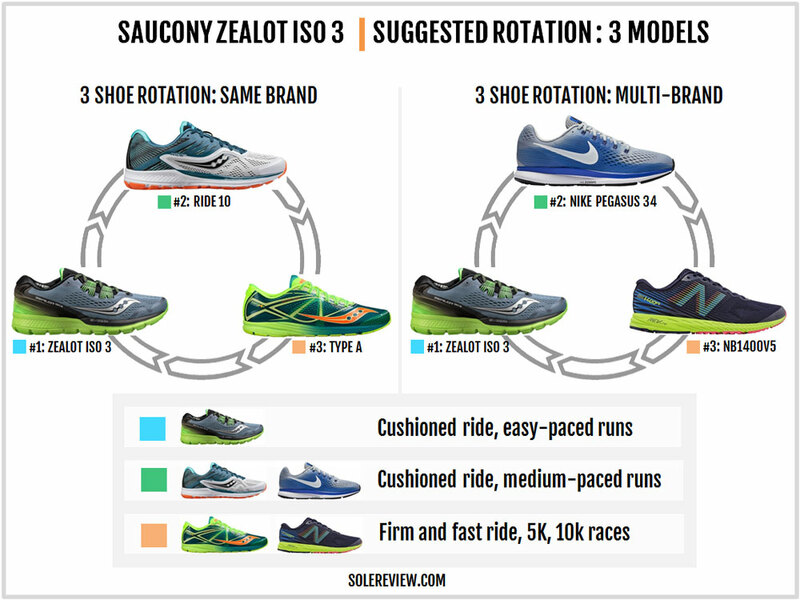 From a category perspective (cushioned 4 mm neutral trainer), the Boracay is the same as the Zealot. It rides a whole lot differently though, and the upper fits a bit narrower. The Skechers twins of the GoRun Ride 6 and the GoRun 5 are well-known trainers with a 4 mm offset. Both models have cushioned midsoles with a decent amount of interior space; this combination works well for long distances runs. We’ll throw the Kinvara into the mix here too. If you’re looking for a firmer, faster, and narrower fitting version of the Zealot, then this is it.